Andrew Campbell has established himself as one of the most versatile collaborative pianists in the United States with a performing career that has taken him to four continents. He has performed in duo recitals with such artists as violinist Chee-Yun, flutist Thomas Robertello, composer Bright Sheng, and tenor Anthony Dean Griffey, with whom he has also collaborated on several operatic productions. He has served as opera rehearsal pianist for such distinguished conductors as André Previn and Plácido Domingo, and has worked closely with the composer Carlisle Floyd on several productions of his operas. Chamber music performances have taken him to distinguished venues including Weill Recital Hall at Carnegie Hall, where The Strad and Strings magazines both hailed his performance as “excellent.” His partnership with violinist Katherine McLin in the McLin/Campbell Duo and McLin and clarinetist RobertSpring in Trio del Sol has led to performances on numerous recital series throughout the United States and Europe. He has recorded several CDs on the Summit and Centaur labels, and his performance of the Rachmaninoff cello sonata with bassist Catalin Rotaru was cited for special praise by Bass World and XBass, two leading international journals. As an orchestral pianist, he has performed with many ensembles including the Phoenix Symphony, the Columbus Pro Musica Chamber Orchestra, and the San Diego Symphony, working with notable conductors including Keith Lockhart, David Effron, and Michael Christie. He has appeared as collaborative pianist at numerous international conferences, including the International Double Reed Society, National Flute Association Convention, MTNA and the Society for American Music. 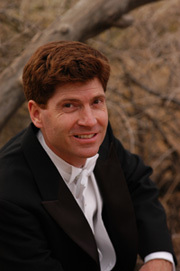 Dr. Campbell is currently Director of the Collaborative Piano Program at the Arizona State University School of Music and is an occasional member of the music staff for the San Diego Opera. During the summer season, he serves on the Artist Faculty of the Taos Opera Institute. Previous positions include Director of the Collaborative Piano Program at the Brevard Music Center in North Carolina, music staff for the Washington National Opera, and Music Director and Pianist for the San Diego Opera Ensemble. Faculty – Arizona State University.